Innovative technology, sophisticated networks, and powerful control elements make ETC products the top choice for performing arts complexes, opera houses, large broadcast studios, and large auditoriums. When lighting professionals think of great lighting systems, they think of ETC – setting the industry’s standards for performance. ETC’s Ion Console provides fully integrated control of conventional lights, moving lights and LEDs. Being highly intuitive and simple to use, Ion will satisfy the needs of beginners and pros alike. 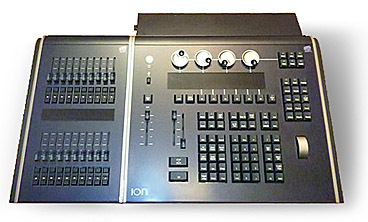 Ion is designed for today’s multimedia lighting rigs. Ion features an integral LCD for soft keys and non-intensity parameter control. The board offers a dedicated master playback fader pair, grand master, and blackout switch. The Ion programming keypad makes frequently used functions easy to access, while physical rotary encoders take the work out of changing colour, focus, and gobos. Ion can be used as a stand-alone console or networked system with up to four Ion devices, such as additional Ion consoles or computers running Eos/Ion client software. Ion can also be used as a client on an Eos system, where it will support the full output of that system.